Tairgíonn Gaelscoil Aonach Urmhumhan oideachas dátheangach cruthanta do do pháiste leis an gCuraclam Bunscoile Athbhreithnithe ata leagtha síos do gach Bunscoil. Tá an Eaglais Chaitliceach ina patrún ar an nGaelscoil ach ta fáilte roimh baill de gach Creideamh chun freastail ar an scoil. In Aonach Urmhumhan, tá an t-ádh linn gur féídir le páistí oideachas iomlán trí Ghaeilge a bhaint amach - ag dul ón Naíonra ar aghaidh don Ghaelscoil agus don Ghaelcholáiste ansin. É sin ráite, nuair a chríochnaíonn na daltaí sa ghaelscoil, tá siad lán ullmhaithe chun freastail ar aon iarbhunscoil. Tá seirbhís mhionbhus ar fáíl chun daltaí a thabhairt ar scoil agus chun iad a thabhairt abhaile maraon le háiseanna aire do leanaí ag costas íseal. Seomraí ranga fairsinge le leabharlanna agus ríomhairí, halla tionóil, limistéir shúgartha, cúirt liathróide agus páírc imeartha. Gaelscoil Aonach Urmhumhan offers your child a holistic bilingual education following the revised Primary School Curriculum designed for all National Schools. The Gaelscoil serves children from Nenagh and surrounding areas. 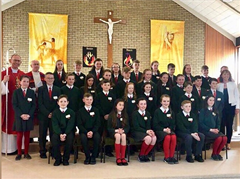 The Gaeilscoil is under the patronage of the Catholic Church but members of all religions are welcome to attend the school. 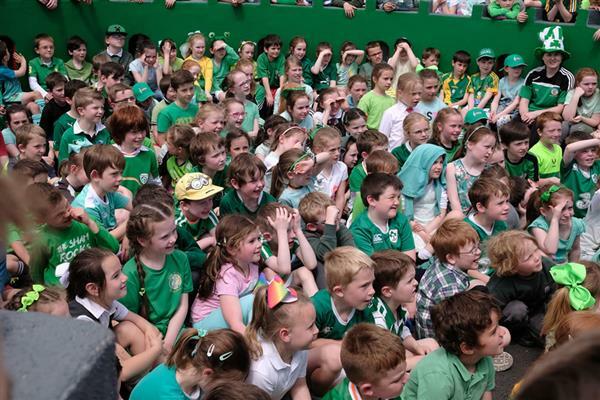 In Nenagh, we are very lucky to have the facility where children can receive an education through the medium of Irish from the Naíonra at pre-school level to the Gaelscoil Primary school. When children finish at the Gaelscoil, their bi-lingual education prepares them excellently to attend any secondary school. A mini bus service is available to collect and deliver children home and to child-minding facilities, at a low cost. The Gaelscoil has a school uniform and track suit. a ball court and playing field.